Rajmahal was founded by Louise Howland and Keith Lamb in 1988. 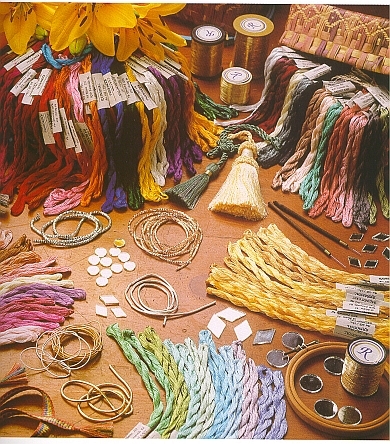 Starting with a boutique range of Art Silk Threads, the Rajmahal range has expanded to include Sadi Threads, Shisha Glass, Metallics, Cords, Tambour Hooks, Kits, Satin Covered Boxes and Needlecraft Books. Rajmahal remains a family owned and operated business, with over 1,000 retail outlets throughout Australia, New Zealand, the U.K., U.S.A., Canada, Ireland and Africa. "Developing high quality embroidery products with beautiful and exciting mediums to enhance your creative stitching & art is our priority". If you have one or more retail stores and are interested in making Rajmahal part of your product line, or using Rajmahal in your manufactures, please contact Rajmahal for a full Trade Information Pack. If you would like free brochures, further information, and a list of retailers closest to your area, please contact Rajmahal. If you are interested in teaching, publishing, designing or demonstrating for Rajmahal, please contact Rajmahal.